If seltzer is your passion, you’ll love this syphon. The 2 quart capacity is double that of most soda siphons. Make seltzer a lot less often and still have it when you want it. 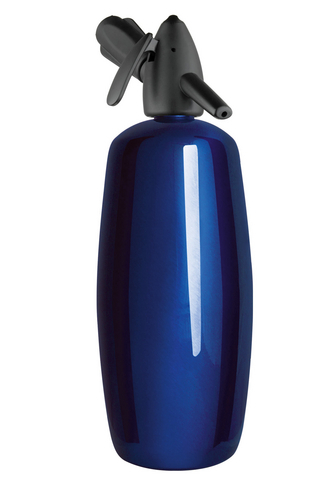 The bottle has a beautiful blue enamel finish and is an excellent value. Liss has introduced a new head for their 2 liter soda siphons! It is a heavier and harder plastic with updated sleeker styling. No chargers are included. Two chargers are needed to make a 2 liter bottle of sparkling water. So don’t forget the extra chargers when you order your bottle. It will save you on the shipping costs. Click here for extra chargers. Click here for Liss 2-Liter Soda Siphon Directions. I finally buckled down and purchased one. I wanted one of the older, all metal, siphons, but they no longer are being manufactured. I acquired the taste for seltzer water when I was in Europe, but buying bottles that lose their spritz the minute you open them is just not cost effective. With this, I get a fresh spritz every time. The only problem I have is the fridge I have. I have to lay the bottle on its side to keep it cold.